We are offering a $1000 Marketing Scholarship. Here at Flip Flops and Apple Sauce we review all kinds of products in a plethora of different categories. These reviews are created to cover all the important aspects of each product and give the user the best advice possible. For example – best wireless dog fence & most comfortable work boots. Though we ourselves are most familiar with internet marketing there are a lot of similarities and traits that teach similar things like business and traditional marketing. We know how important these qualities are and we want to help support a lucky student with this. Our scholarship is both open to Undergraduates and Postgraduates alike and is not restricted to any course or level. In internet marketing, a lot of the most important qualities fall down to simply creating engaging and interesting content. If you can do that successfully you are on the right track to starting your own successful online business. So, with that in mind if you would like to apply to this scholarship all you have to do is write an article of 500-1000 words of what you feel are the most significant similarities and differences between traditional marketing and internet marketing. The best submission will earn the scholarship. 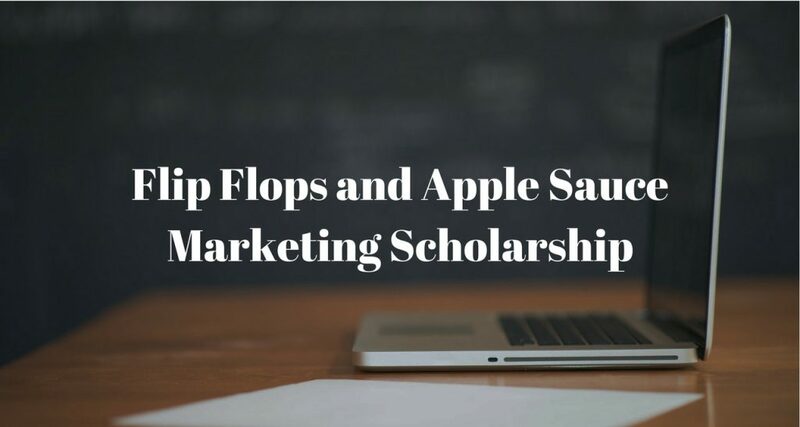 Once you have written your submission you should send an email with the article attached (word doc format) to scholarship@flipflopsandapplesauce.com. Proof you will be attending/are already attending etc. Our scholarship runs twice annually and has deadline dates of March 15th and November 15th. If you submit after the deadline date you will automatically be entered for the following admission. Thank you for reading we look forward to reading your submissions, Good Luck! The Flip Flops and Apple Sauce Team.